Alumni Program and Career Service of TU Berlin were presented with the first prize in the "Premium D-A-CH" 2014 – competition. The organizing alumni-clubs.net (acn) honored their successful cooperative concept. The award includes a prize money of 10,000 euros and was presened during the 19th acn conference which took place at Georg-August-Universität Göttingen on May 9, 2014. TU Berlin's concept is based on close cooperation between alumni and career service departments and has achieved substantial success with its university-wide strategy for several years. The Association of German Press Officers has pronounced TU Berlin's Office for Press, Public Relations and Alumni "Press Office of the Year" 2013. The award was presented at the public "Speakers' Night" on September 26, 2013 at Friedrichsstadtpalast Berlin in the presence of 1600 press officers from all over Germany. The Association of German Press Officers is the biggest association in the field of communications and public relations in Germany. Dr. Kristina R. Zerges, long-time head of the Public Relations and Public Information Office as well as spokesperson for the TU Berlin, was awarded the university's badge of honour in gold in March 2010. With this, the president of the TU Berlin, Prof. Dr. Dr. h.c. Kurt Kutzler, recognized her achievements for university public relations and science communication. 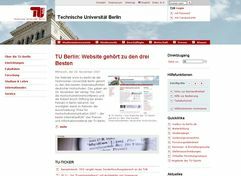 The TU Berlin website www.tu-berlin.de is one of the three best German university internet sites. 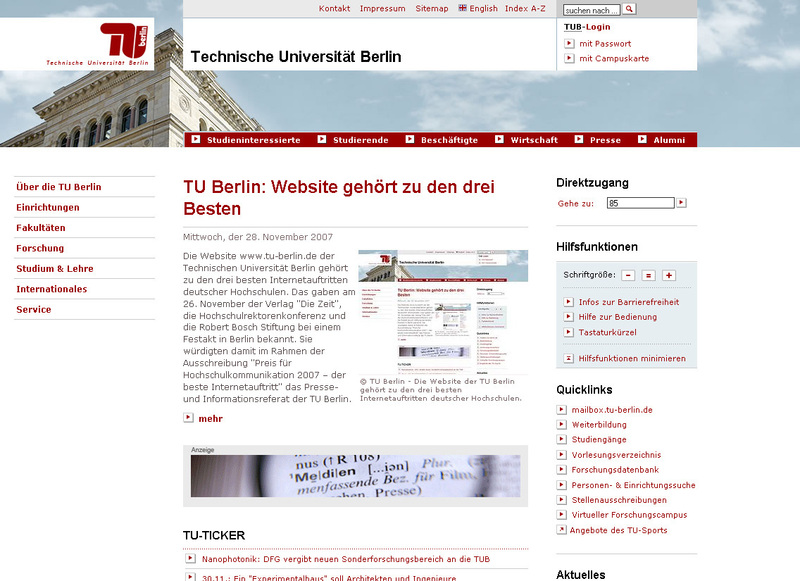 At a ceremony held in Berlin in November 2007, the publishing house "Die Zeit", the German Rector's Conference and the Robert Bosch-Foundation recognized the TU Berlin Office for Press, Public Relations and Alumni as one of the runners-up for the "Prize for academic communication 2007 - best website". Our online editorial staff manages the central web pages of the TU Berlin as well as the online services of the PR Office itself. In November of 2005, the TU's Office for Press, Public Relations and Alumni received a distinguished award for its target group specific and professional publishing concepts. In the context of this competition we were granted first prize for the "best publishing concept of any German university". The competition was sponsored by the weekly newspaper "Die Zeit", the German Rector's Conference and the Robert Bosch-Foundation. The prize money amounted to 10,000 euros. Even as early as 2001, the TU Berlin received the highest ranking for its PR internet services from among the 324 online services of German universities that were competing. Our concept for providing services to our German alumni also placed in the top ten in the 2001 nation-wide competition "Alumni Networks", which was sponsored by the Stifterverband (Association of German foundations).